We have been working again this weekend proofing university buildings against pest birds, including pigeons. We tend to do these jobs on Saturdays and Sundays, to avoid blocking roads and pavements with our access equipment. 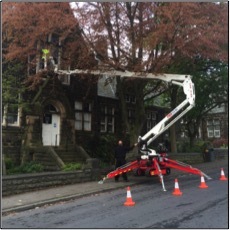 This work usually involves fitting devices to buildings to prevent birds nesting and roosting on structures causing hygiene problems for the people that work in and around them. We can install netting, spike and wire systems and carry out cleaning/sanitising. These systems do not harm the birds in any way but exclude birds from inhabited areas. These measures should last for many years and are very effective. We can remove pest birds from virtually any building and our recent work has included civic buildings, universities and large food factories.